The concepts of biodiversity and evolution are generally thought of as something that occurs in thousands, maybe millions of years – but every once in a while, scientists catch a species red handed: evolving, becoming a new species. The parasitic wasp, Utetes canaliculatus, on a snowberry shrub, searching for its Rhagoletis fly host. 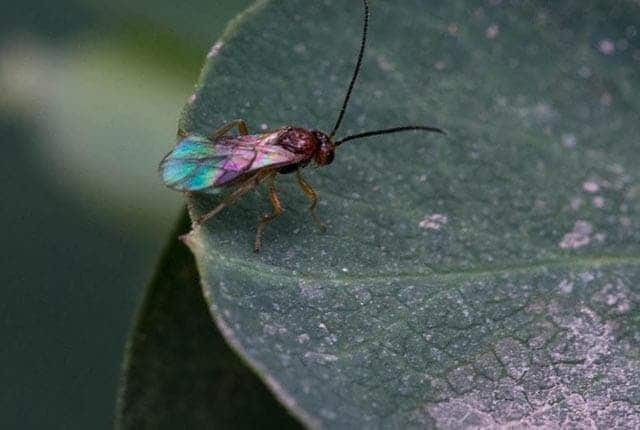 A new biological study from Rice University did just that, finding that evolutionary changes in one fruit fly species are having a domino effect on at least three species of predatory wasps, forcing them to evolve as well. “Our study addresses one of the central questions in biology: How do new forms of life originate?” said evolutionary biologist Scott Egan, assistant professor of biosciences at Rice and a co-author of the new study, which is available online in the Proceedings of the National Academy of Sciences. They study comes at the back of previous research by Egan and colleagues on the fruit fly Rhagoletis pomonella, aka the “apple maggot,” which began plaguing U.S. apple growers in the 1850s. Their work showed that Rhagoletis is changing its eating habits so much that it’s actually diverging into two different species. The cycle is driven by the different timing of fruiting cycles between apple trees, which some of them now prefer, and the North American hawthorn, where they traditionally used to lay their eggs. Interestingly enough, human horticulture is leading to the development of a new species. Now, this study found that something similar is happening to three wasp species – they are already undergoing significant changes, both in genetic terms and in terms of their physiology and behavior. “The new study extends the earlier work by showing that new fruit fly species provide suitable habitat not just for one new parasitoid species, but for multiple new species,” said study co-author James Smith, a Michigan State entomologist. This type of evolution happens in sequential events, also called “cascading” events. Studying these events could provide researchers with additional information about why certain organisms like plants and insects are more diverse and species-rich than other groups, such as mammals. It also shows that despite what many people think, biology can be quite dynamic, and happen much faster than expected.